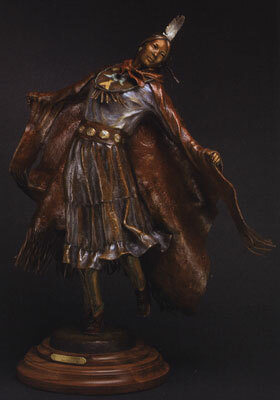 Susan Kliewer, Navajo Powwow Dancer, Bronze, 23" x 23" x 12"
A little piece of Susan Kliewer’s heart goes into each and every sculpture she molds. Based in Sedona, Arizona, this contemporary Southwest sculptor depicts the Navajo people she knew and loved when she managed the Marble Canyon Trading Post for five years on the Navajo reservation. The artist often uses her grandchildren and Native American friends as models to capture the special intimacy that is the hallmark of her work. 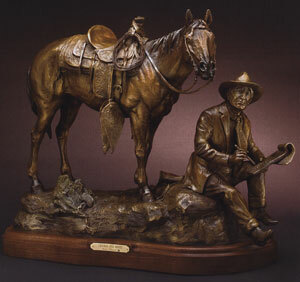 Her warm sentiments translate to the cowboys and Native Americans she captures in bronze. Kliewer strives to show the common thread that underlies all human experience, as evident in her recent piece titled Shima (Navajo for mother), which masterfully captures the universal unspoken bond between a mother and child. 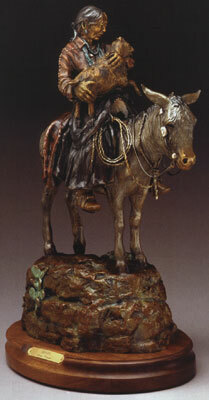 Susan Kliewer, Charlie and Monte, Bronze Edition of 35, 18.5" x 21.5" x 7"
Kliewer’s depiction of the ways of Native Americans in everyday life, from the past as well as the present, has attracted major collectors from all over the world. Her Dineh series includes Navajo Weaver, which alludes to months spent at the loom producing a Navajo blanket, and Gridlock at Window Rock, which shows a Navajo boy who has been herding his sheep all day and wants nothing more than to get home and have a bowl of mutton stew. Unfortunately the sheep aren’t cooperating. “This Navajo boy is trying to shoo them but smiling because he finds it amusing,” says Kliewer. Susan Kliewer, Mischievous Ones, Bronze, 17.5" x 24" x 18"
Gridlock at Window Rock, Shima and Navajo Weaver are among 13 two-thirds life-size bronzes that will be going to Na ‘Aina Kai (“Lands by the Sea” in Hawaiian), a non-profit botanical garden in Kauai, Hawaii. Kliewer has been asked to contribute work to its new Navajo family village that will teach children about the Southwest through interrelating sculptures. 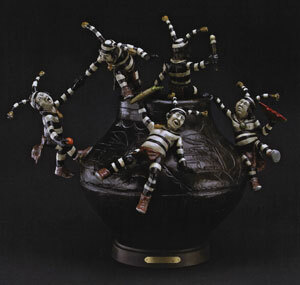 Medicine Man Gallery in Tucson boasts an extensive collection of bronzes by Kliewer. Her work has been featured in two gallery’s recent exhibitions, Historic Trading Posts of the West, which runs through March 28, and Geronimo Remembered: A Retrospective 100 Years after his Death, which continues through April 15. The gallery will spotlight Kliewer’s maquettes throughout April, including up to four never-before-seen pieces. Fresh from the foundry, the bronze titled Navajo Powwow Dancer represents a brighter future for the new generation, while in contrast, Navajo Weaver represents past tradition. Susan Kliewer, Ama'Sa'ni (Navajo for grandmother) Bronze Edition of 45, 20" x 13" x 8"